Priya said, I wanted to give something exclusive on Amma’s second death anniversary. 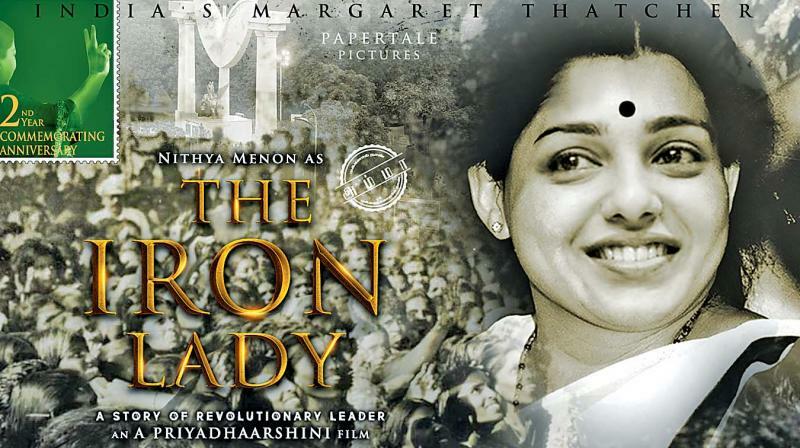 The Iron Lady, came out with a poster featuring Nithya Menen who essays Amma with an image makeover. While many associated with former CM Jayalalithaa have shared their experiences on various media, director Priyadaarshini, who is coming out with the biopic of Jaya titled The Iron Lady, came out with a poster featuring Nithya Menen who essays Amma with an image makeover. Talking to DC, Priya said, “I wanted to give something exclusive on Amma’s second death anniversary. So released the new poster with Nithya Menen madam”. Ask her if a photoshoot was done, she says, “No, we decided at the last minute and hence could not get Nithya’s time. The image makeover was done using computer graphics”. She had intially tried to cast Mohanlal to play MGR, but it didn’t quite work out and Priya, who has an alternative, discloses now, “We plan to approach SJ Suryah to essay legendary MGR. We worked on a few designs with SJ Suryah’s pictures and he was perfectly matching MGR’s looks.